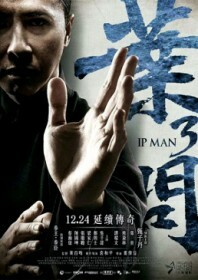 Five years after the second instalment, actor Donnie Yen and director Wilson Yip return to the Ip Man franchise for a third time. Yen slips back into his most defining role with impeccable ease and style, mastering both humility and intensity in equal measure and proving why he is currently the world’s most prominent kung fu star. Yip, however, forgoes the fiery jingoism of the previous films in favour of a small town domestic drama, with the ageing Ip Man facing conflict on three counts. Firstly, we see disenfranchised youth searching for lucrative opportunities in export-rich late-fifties Hong Kong. Young workers are shown to be shunning the virtuous notions of their sifu’s generation in favour of the quick-wins afforded by a life of crime. The gangs take over the local primary school and kidnap some of the kids, including Ip’s young son. In a remarkable marketing coup for the filmmakers, Mike Tyson has been secured to play the gang leader, although it’s never quite clear as to where he fits into the story. His blistering fight scene with Donnie Yen – exciting though it is – seems quite removed from the rest of the film. Secondly, Ip Man faces a battle for Wing Chun supremacy with a rival fighter, Cheung Tin-chi (played magnificently by Max Zhang). He’s a lowly rickshaw driver and single father who holds a contrasting mirror to Ip’s domestic bliss, wealth and superiority. And thirdly, Ip Man’s dedication to philanthropy and valour causes him to neglect the troubles brewing within his own home, where his wife (Lynn Hung) has been diagnosed with terminal cancer. This is another quite thankless role for Hung, who remains in her husband’s shadow and whose illness is used as a device to add emotional depth and motivation to Ip Man’s actions. All three of these plot-lines jostle for supremacy, and the gang element is abandoned entirely. However, there is a good-natured lightness to the film (a teenage Bruce Lee even swings by for mostly comedic effect), and the more jovial elements are evenly counterbalanced by brilliant action scenes. The final bout between Donnie Yen and John Zhang is a particular highlight and adequately expresses why the Wing Chun style has been so favoured by chopsocky cinema’s best fight choreographers, and why Ip Man’s cinematic legacy has been so potent since the first film’s release back in 2008.